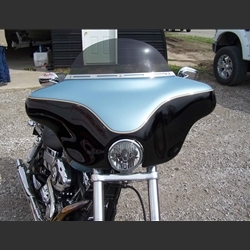 The Harley-Davidson Dyna Wide Glide fairing attaches to Memphis Shade Adj. Clamp Brackets. We must know the Fork Tube Size. The turn signals need to be moved. These will allow you to do this.